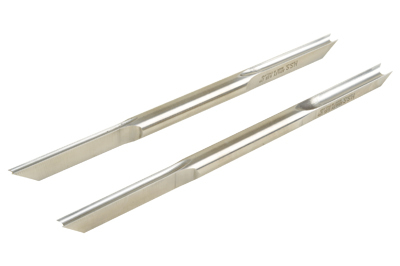 Ashley Iles has just created two new double-ended bead-forming tools to Simon Hope's design. These are made from 13mm round bar. One tool has the facility to cut 3mm and 7mm beads, and the other 5mm and 10mm beads. Apart from the 3mm bead-forming size, the others are different sizes from those sold by Ashley Iles in their other range. high and the blade low, cutting in what is the underside of the work and effectively forming the bead by negative-rake cutting, giving the tool a little wiggle in the process. The flutes on these tools are perfectly formed to create a bead, which is just deeper than a true semicircle. All in all, these tools from Ashley Iles are simple to use, stable in use and well finished, but are best used on dense close-grained hardwoods for best effect.